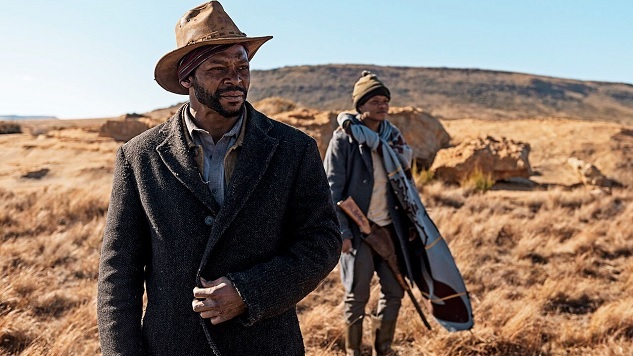 Tau (Vuyo Dabula), the conflicted protagonist of Michael Matthews’ Five Fingers for Marseille, walks the walk and talks the talk of the reformed gunslinger common in Western movies—of Will Munny, Jimmy Ringo, the Waco Kid, Charley Postlewaite and others. From the film’s start to its senselessly bloody finish, Tau battles his past—his sense of duty to his homeland and his people at odds with his criminal record. He wants to do good. He’s stymied by his history of doing bad. That’s the fate of the fighter traveling a redemptive road. What separates Tau from his predecessors in the Western canon is the film’s setting, removed from the plains and plateaus of America’s Old West to the hinterlands of South Africa. In Five Fingers for Marseille, we see a Western tale that’s familiar and new at the same time, a story of penance and pistols where the living and the dead are sorted out based on their aim and their quickdraw, but set against the backdrop of the settled instead of the settlers. Most Western movies focus on those seeking prosperity or peace in the unforgiving cradle of the new American frontier. Five Fingers for Marseille focuses on characters living with the consequences of colonization perpetrated by Europeans of every stripe: the Italians, the Spanish and, of course, the French. Luyanda and Sepoko are two spokes on the axis of New Marseilles’ power dynamics, effectively sponsored by another of Tau’s old chums, Bongani (Kenneth Nkosi), mayor of New Marseilles, who governs through complicity in criminal activity: He wheels and deals with both villains and naively hopes to serve his constituents through a “less harm than good” governance philosophy. Tau just wants peace, and seeks to avoid all three of them. But Westerns are about formula, so we know collision between the good, the bad and the ugly is inevitable. If you expect anything more from the film than that, you’ll be let down. Five Fingers for Marseille is nothing if not loyal to its Western blueprint, but this exposes the plot to predictability. There’s no effort made at tilling the ground the story treads: Knowing the contours of the genre means knowing where Matthews wants to take his characters as he examines the complications and contradictions of administering justice in an unjust place. Given that New Marseilles has developed from beneath the heels of South Africa’s conquerors, many of the problems faced by its inhabitants stem from sins of the colonists as Five Fingers for Marseille builds a stage on which characters must struggle to make a new world of what’s left of the old one, the world before colonial intervention. The prospect of new territory explored through new perspectives is exciting at first, as the movie’s genre trappings are cast anew with an eye on world history (and not American history). Indeed, Five Fingers for Marseille works best when Matthews scrapes back the Western surface details to illuminate the essential details of South Africa’s past layered beneath. This extends in particular to the film’s opening, where we meet the Five Fingers as kids and see the biases that define Marseilles through their eyes. In the long run Five Fingers for Marseille might have been better off staying with those kids, watching them try to fight with such means as they have at their disposal and getting to know them before the passage of time pounds them into shape like metal on a blacksmith’s anvil. But that necessary connective tissue never forms. Through the majority of Five Fingers for Marseille, Matthews follows rough sketches that yield neither fully formed characters nor a fleshed-out narrative. The film’s vistas are beautiful and Matthews’s aim, high, but those aspirations are not fully realized in what feels like a first draft attempt at brushing Western customs with textures drawn from a South African palette.